Here is an old glove trick straight from the surgical suite. Back in the day, before latex, surgical gloves were resterilized and reused for subsequent surgeries. 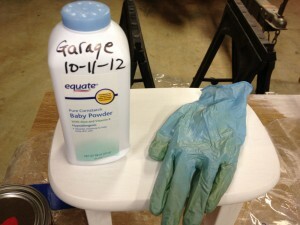 To make regloving easier, talcum powder was added to the inside of the gloves. Of course, eventually doctors noticed that powder caused a foreign-body reaction in their patients and became more careful, ensuring no powder got on the outside of the glove. Surgical gloves are no longer “reusable,” but that doesn’t mean we can’t use that trick to make donning used gloves easier. A little drying and some talcum powder and you can use those “disposable” gloves over and over. Just be careful not to mix dissimilar materials, like paint remover and finish. Purchase your shop its own bottle of talcum powder. Using your wife’s powder will only make your life miserable. Over time you’ll learn how little powder you can get by with and still get the gloves on easily. Like those early surgeons, be careful not to get talcum on the outside of the glove where it might find its way into your finish. The easiest technique is to put a pair on inside-out, apply the powder to the palm of the right glove and rub the back of the left, then alternate. Pull both gloves off right-side-out and they are ready for the next use. Helpful stuff. It’s not being cheap at all, it’s more like cleverly thrift. But one thing though, doesn’t it cause any irritations over time? Hi, James. You know the old saw, “They don’t make ’em like they used to.” Same applies to gloves. Surgical gloves of the 80s would last a long, long time. Of course, we used them for surgery only once, because they were sterile only once, but if you powdered them inside and the other jobs you had for them weren’t too rough, there were several other things they were good for. Today’s surgical gloves will typically tear the first time you don them after powdering. Ditto for latex and nitrile gloves you use in the shop. They won’t last long enough to grow mildew or other irritating creatures. I also powder my meant-to-be-reused gloves, and turning them inside-out every once in a while for a really good drying is a good idea. Thanks for reading! This is a great tip – thanks for sharing. I also re-use a number of things whenever I am doing crafty projects because these things aren’t that cheap – especially if you are doing it for so long. Wow, this is another helpful tip! I also buy gloves but the non-surgical ones – only those I use to clean the house and wash dishes with. Does this trick apply to that, too?